A look at how the current top 20 prospects did today. Note that this list doesn’t include players currently in the majors (Stolmy Pimentel #13). If a player is in the majors, he will be removed, everyone below him will be shifted up a spot, and a new player will be added to the bottom of the list. If a player is out for the season (Jameson Taillon #2, Clay Holmes #12), he will be removed and everyone below him will move up a spot. Removing these guys doesn’t mean they have lost prospect status. It is just an attempt to get 20 active prospects on the list. Rankings are from the 2014 Prospect Guide, and links on each name go to their Pirates Prospects player pages. 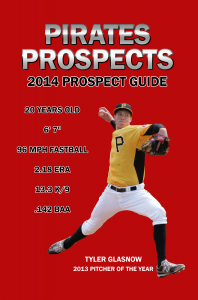 The 2014 Prospect Guide is now available, and is the perfect resource to follow the minor league system during the 2014 season. You can order your copy on the products page of the site. Game Notes: After a pair of poor outings, Jake Brigham has compiled three consecutive quality starts. Though he took the loss, Brigham stuck out seven hitters. He has 16 in his last three starts. Jaff Decker picked up a couple of hits and three walks. Decker is 7-for-11 in his last four games with three doubles. Scranton’s starter was Zach Nuding, an unsigned 2009 draft pick of the Pirates. Diego Moreno also pitched against Indianapolis tonight. He was part of the A.J. Burnett trade. Game Notes: Altoona went into the seventh inning stretch with a 7-2 lead on Thursday night. Two innings later, they trailed by two runs after Akron put up a total of seven runs off three different pitchers. Adrian Sampson looked good through six innings, allowing two runs and needing just 77 pitches to get through his work, but he tried to go seven innings for the first time this season and he ended up getting just one out and giving up two more runs. It was the first time all year that he allowed more than two runs in a game. Sampson came into the game with a 1.53 ERA and averaging nearly a strikeout per inning, but most of those came early in the season. He finished with one strikeout on the night, giving him four total in his last three starts. Altoona flexed some muscle on offense with two homers off the bat of Keon Broxton and one each from Willy Garcia and Elias Diaz. The Curve had 12 hits and only Alen Hanson was unable to reach base safely. Game Notes: Harold Ramirez returned to the West Virginia lineup after a month-long absence and went 1-for-4 with two stolen bases. He was out with a hamstring injury, so the stolen bases are a great sign. Erich Weiss had a nice game at the plate with two doubles and a walk, but he had some trouble in the field, committing three errors. Reese McGuire had a similar game, collecting an RBI and two hits, but he made an error and had two passed balls. Dovydas Neverauskas started the season with two strong starts, but his four starts since then have not been that good. In two of them, including tonight’s game, he was unable to get through five innings. In the other two games, he went five innings in each, but gave up a total of 21 base runners and ten runs. Josh Bell was supposed to be the next big thing. But so far in his career he has seemed like a decent hitter with little speed or defensive value. Is he still suffering lingering effects of his knee injury? Or was he just over-hyped when he was drafted? My guess at this point is that he will wind up being a Firstbaseperson or utility player (corner OF, 1B, DH, pinch hitter) with moderate offensive value and no defensive value. He has little chance of claiming a starting role in the Pirate OF any time in the next 5 years. That would be a huge disappointment based on the hype surrounding him a few years ago. Last year was his first full season in the minors as a 20 year old in A ball coming off a knee injury….and he had a wRC+ of 131. I’m not sure I understand your narrative. To put it further in perspective, despite missing the better part of a year of development, Bell is right in line with most of his peers (hitters drafted out of high school in the mid-1st to 2nd round). I don’t think we’ve learned anything so far that would suggest he’s no longer an upper tier prospect. If he’s still at a .735ish OPS at the end of the season, yeah, maybe you have some concerns. Not now. And to add to that, it is about the player’s ability to grow and to see potential. He had 13 HRs and 37 doubles. Those doubles show power potential. If he would have converted say 20% of those doubles into HR, he would have ended up with 21 or 22 in his first year. If he averages one year a level, he is in the majors at 24. And seeing that most of his at bats come from the left side in PNC he may convert a higher number then 20%. Not really a narrative. Nor am I trying to convince anybody they should not have confidence in Josh Bell. In a few years we will all know what kind of player he is. For now, I am concerned that the Bucs invested heavily in a kid who was over-hyped. I don’t see him having any speed or defensive value, and I have not yet seen him hit like a potential star. He is no longer that young for a prospect and he is still playing in high-A. I am a long-term Pirate fan, so I hope that I am not only wrong, but that I am so far off base that I wind up looking like a fool for doubting Bell’s talent. But from my perspective, I don’t see any skill set in Bell that I have not seen in a hundred other mid-level prospects who never amounted to much. You actually make some great points. I don’t think anyone is ready to give up on him, but I think more than just you and I are underwhelmed so far. His speed has been impacted, although he wasn’t going to win any SB title’s previously. His defense isn’t fantastic (but I’m a firm believer that anyone can be a good fielder if they practice enough and focus on it) his raw power is probably #3 in our minor league system behind Allie and Garcia, but he may or may not ever have it amount to home runs. I don’t think any of us want a ML first baseman striking out 130 times hitting 15 hr and 35 doubles. That just isn’t going to cut it unless he’s hitting .300 and I just don’t see that at this point. I don’t want a switch hitting Nick Markakis who strikes out twice as much playing first base, so lets hope the light goes on….I think next year will really tell what we’ve got. that is, if he doesn’t figure it out before then.